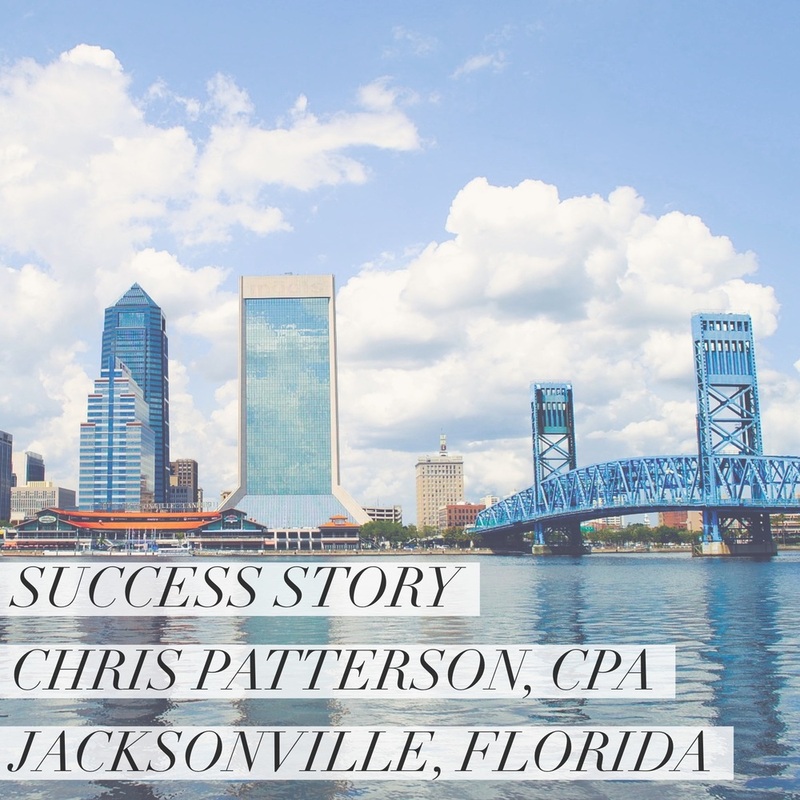 This month our success story hails from the Jacksonville area of Florida . Chris attended the Plan I practice development seminar in Orlando , FL during January of this year. He was interested in the Plan 2 program but not willing to commit without meeting some of the NCI staff and learning this system through the seminar.He obviously liked what he saw because he upgraded right then and there to a Plan 2 program which got underway in February. Since getting started only a few short months ago, Chris has dramatically added to the growth of his practice with the help of the marketing staff that we installed for him. Take a look at our interview below. Chris: Tell me a little about your background. Chris P: I went maybe an untraditional route. I went to the University of Central Florida here in Jacksonville. And graduated eventually with a business management degree and went into insurance and investment sales. Of course my father had started an accounting firm several years before that, and I decided after a couple years out in the real world to join my dad. So I went back and got an accounting degree from the University of North Florida , and joined dad about six years ago. I honestly had probably flirted with NCI for about two or three years before we actually signed on and that’s the progression of how we got to you guys. Chris: When did you start the Plan 2 program and how much growth has it added for you since? Chris P: Our first week of actual marketing was February the 25th of this year. We have added, we had only one drop, but we’ve added I believe 24 monthly accounts between then and now. We’ve also picked up several other engagements, we picked up an audit engagement and we picked up, I can’t even tell you how many tax returns, probably 15 plus tax returns. In terms of our recurring billings, just through the monthly ACH drafts, August 1st will be write up, $6,000. In June we collected well over $12,000 we’re averaging over $12,000 a month, so round numbers at this point, about $50,000. Chris: What brought you to NCI a few years ago? Chris P: Probably one of your ads in the Journal of Accountancy or one of those, that was the first time that I had seen it and honestly what I liked about it was that the approach was very similar to what I had done when I was selling insurance and investments. So I was very comfortable with the approach but it was extremely foreign to my dad. He was not in favor of it at all initially and it took a few years of “we should do this, we should do this” and I probably talked to 20 different accountants who had gone through the program. Because you know it’s one of those things where you’re not even sure it’s real, it almost seemed too good to be true. I had originally signed up for plan I and what really helped me was going to the seminar, meeting your dad, meeting you, meeting Todd [Steinberg, NCI Account Executive], meeting Troy [Patton, NCI seminar conductor and successful client.] It felt like a very family oriented environment, it felt like everyone was on the same team and that helped a ton in terms of making this decision. Chris: What was your biggest concern before signing up for the Plan 2? Chris P: Just the money, just committing those dollars to a Plan 2 program. Chris: What has been your biggest challenge in running the program? Chris P: Well you know the economy’s slowed down quite a bit. I’d say we’ve had a few challenges from the standpoint that initially we were not pricing the accounts correctly. We we’re going really low on our fees thinking we could do the work quickly and it just never works out that way. I’ve changed my focus from number of accounts to amount of recurring billings, in terms of the goals and targets we’re trying to hit. So far this month we’ve added two accounts and total recurring billings from those two accounts are $900 so that’s $450 an account. So that was one challenge initially and I felt like we overcame that. Another challenge, well honestly the biggest challenge we’ve had is just the setup. Like you guys talk about, just getting the work, getting it all processed and getting everything set up and ready to go in a timely manner. I actually just brought on a part time person to handle nothing but client setup. We’re lucky in that we’ve had the same CSR and the same two appointment setters from day one. And just in general, keeping a positive outlook when things seem to not be going that well. Because [when] we came out of the gates, we picked up seven new accounts on the first week. Then things slowed down some. So it’s just dealing with the ups and downs, kind of just set a target for your self and just work towards that target and understand there’s going to be peaks and valleys and you’ve got to deal with it, like with anything, really. Chris: Future goals and plans for the firm? Chris P: At the end of last year we developed a three year, strategic objective. Our goal at the end of those three years is to have 300 monthly write-up accounts. We’re sitting right now at 50 accounts so the NCI program is going to be on full charge for a while. That’s our intermediate goal. I’ve studied Troy ‘s model quite a bit in terms of opening up offices in other locations and we’re big E-myth believers and we’re trying to build a prototype firm right now over the next three years that can be replicated going forward. Chris: What advice would you give to someone considering a Plan 2 program? Chris P: The biggest piece of advice that I would give is to really think long and hard about what you want your firm to be, what you want your firm to look like. If you decide that your vision for the firm is to be high production monthly write-up type firm, then I just don’t know how you would get there if you’re not doing the NCI program. The thing with you guys is, you pay a good fee, you pay a nice fee [for the Plan 2] but you’re buying the system and I’m a big believer in systems and procedures and you’re buying a turn key system that will work. Don’t get me wrong it was well worth the investment, when you think about it we put in 30 grand or whatever we put into it and you know in four months we’ve generated over $50,000 in new billings, with more coming. The biggest piece of advice I can give is to really have a vision for your firm and where you want to be and use that as your guiding light. Like I said if you want to be a high production monthly write up firm, then you’ve got to do something more then just joining the local rotary club and wait[ing] for business to come in. And kind of a backup point to that is, if you decide to go with NCI you better damn sure be ready to process some work. Chris P: [Laughs] It’s actually gotten a little worse. But basically that goes back to my point about the vision. But you have to understand too, in terms of quality of life for the long term, we’re going to be a firm that’s not so damn dependant on what happens during tax season. We’re going to be a firm that eventually has $50, $60, $70,000 of recurring monthly income the first of every month. So then you start talking about quality of life, what does that look like? It’s a whole lot better then what it is right now. Chris: Can you sum up your feelings about NCI and our Plan 2 program? Chris P: I would say in two words, it works. I think the pleasant surprise for me was the support that you guys provide. Wayne Minks [ NCI head of service and support] has really, really helped us in the pricing of our accounts. Also, Todd [Steinberg] for the first month, month and a half was really a sounding board for me just dealing with some of the ups and downs and it really helped. So the support has been great and like I said, it felt like everyone was on a team when I was at the seminar and it still feels that way so I think that’s been the most pleasant surprise but it works, so if you sign up be prepared to process that work. Chris: Chris I want to thank you again for taking time from your busy schedule to do this interview with me. Good luck reaching your goals as you continue to grow and prosper. For everyone else reading this, take Chris’s words to heart. If you’ve been reading these success stories, wishing for the kind of growth evidenced in our clients’ words, if the current state of the economy has you wondering what will come next in an uncertain future, well my answer to those concerns is to do something about it. Call us at 800-338-0778 to speak with someone who can help get you on the path to reaching your business goals and to not only weathering the current economic situation but to growing throughout it! Editor’s Note: The E Myth is a best selling book by Michael Gerber. It’s main focus is on how business owners can work on their business as opposed to in it. This is achieved through delegating work out to others and creating systems that can be replicated.